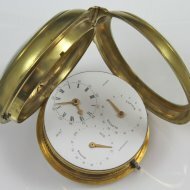 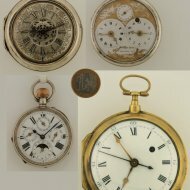 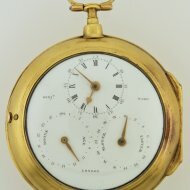 #1802 Large gilded double face verge/fusee/stop central seconds pocket watch. 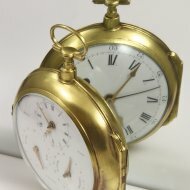 SOLD Large gilded double face watch. 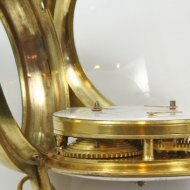 On one side an enamel dial with central seconds. 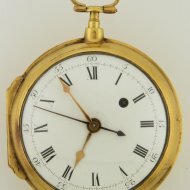 The other side has an enamel dial with hour/minutes, moon days, adjustment and a signature of 'Benj.n Ward, London'. 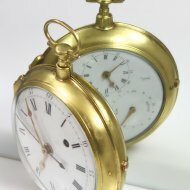 Diameter 80 mm, total length 106 mm, weight ca. 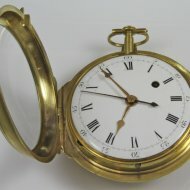 300 gr.